Derek Gentry: Born from jets; hoping for rebirth. Born from jets; hoping for rebirth. 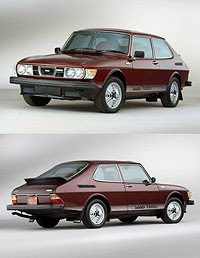 I still remember the Saab that got me—a dark red 1978 99 Turbo that I spotted at a donut shop when I was nine. It was a startling vehicle, with its clamshell hood, crazy wrap-around windshield, and rakish, swooping hatch. To me, it looked like some kind of spaceship, but cooler than anything George Lucas could’ve imagined. Even the nameplate seemed otherworldly: SAAB. I remember thinking that I’d probably never get a chance to ride in anything so exotic. But just a few years later, my father began working for a Swedish firm, and his company car was a blue 1984 Saab 900 Turbo. Riding in its cockpit for the first time, feeling the whoosh of the turbocharger that seemed ready to lift us right off the pavement, I was hooked. I’ve owned four different Saabs since then, two of which are still in my driveway. Like most Saab aficionados, I was never happy about GM’s dulling influence on the company, but I also grudgingly recognized that, without GM’s investment, Saab might’ve disappeared years ago. Still, that knowledge hasn’t made it any less painful to watch GM's recent treatment of Saab, first trying to sell them off like some toxic asset, and later announcing that they would just shut them down. That one really had me scratching my head. Sure, Saabs have always featured some nifty engineering, but does the company really possess some secret technology that simply cannot fall into Russian hands? And if said technology does exist, why hasn’t GM exploited it to, you know, make money? I'm beginning to suspect that GM is content to let Saab die because they'd rather not see the brand succeed under someone else’s stewardship—a turn of events that would just underline GM's own failure. And perhaps GM doesn't want any of their future vehicles—be they Chevys, Opels or Vauxhalls—to be forced to compete with a reinvigorated Saab, whose owners have always been among the world's most loyal and enthusiastic. Maybe that mysterious Saabist devotion is the real "technology" that GM is hesitant to sell. As of today, GM has reportedly reopened the door to potential buyers; here's hoping that they can work something out. If not, maybe I'll see if I can track down that 99 Turbo from the donut shop, or an old 900 like Dad's—both cars are still more original and inspiring to me than anything Detroit has produced in the last thirty years. Well done Derek. Since we spoke at the wedding I've been even more aware of all the SAAB's that 'live' in my neighborhood. Too many folks are going to be pissed if GM lets this one die. My sister-in-law bought a 900S at the end of high school, and her first new car was the 9-5 wagon that is now her mommy-mobile. I have to say, they were good solid cars to drive. Sadly GM is also disposing of the company that built the first new car Kate and I bought - Saturn. The nameplate has slid from its initial heady days when all their cars came out of a state of the art plant in Spring Hill, TN. That car was pretty damn good too. The clutch on that '94 SW2 lasted 150K despite taking the abuse of being the clutch that five people learned to drive stick on. I agree, Casey--Saab and Saturn always seemed like the most interesting things GM ever did...although I guess one could argue that the Pontiac Aztek was "interesting" in its own way.